Update on the Compact for America SB2328 | No Convention of States! Please urge your Arizona Legislator to vote NO on HB2328 Compact for America OR ANY STRIKE ALL EQUIVALENT or Amendment! The organization behind the push to convince states to call for a constitutional convention (con-con), in hopes of getting a balanced budget amendment adopted, is falling further and further behind schedule. Compact for America–The Compact for America initiative has plans to have 38 states call for a con-con to adopt a balanced budget amendment on July 4, 2013. The majority of their efforts have been defeated at the state level. Most of their efforts were stopped while proposed bills were still in committee. Only a dozen or so states have introduced bills. Reports from our National Visit Your State Legislator Day held last month indicate that many legislators had not heard of the initiative and were dead set against it. Those contributing to the initiative’s self-proclaimed $28 million+ budget must be asking themselves about results or lack thereof. Our Stance on Con-Con—We remain against calling for a con-con, mainly because if a convention is called there is historical precedent that it cannot be controlled, with the potential end result of a complete rewriting of the Constitution. 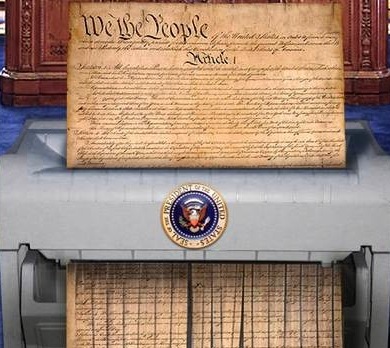 Would you trust anyone in today’s government to rewrite the Constitution? A reminder: any state NOT party to the Compact for America is STILL LEGALLY ENTITLED TO PRESENT ITS CALL TO THE CONVENTION! Congress has the authority to balance the budget now. It isn’t the Constitution that needs to be changed; it’s the attitude of today’s politicians. Balancing the Budget Before 1913–Do you know how Congress used to balance the budget prior to the 17th Amendment (direct election of US Senators)? The U.S. House of Representatives would offer a budget that best represented the interests of their constituents. Unfortunately, they were not immune to pork-laden bills. However, the U.S. Senate, whose job it was to best represent the states (they were appointed by the states to do as such), would get a hold of the proposed budget and hack out the majority of the pork. Why? Because any spending that was above the generated revenue had to be paid off by the state legislatures, which were sent bills with the proportioned amount owed. State legislators, looking out for the best interests of their constituents, did not want to pass along the federal government spending burden to voters, so they made sure that those they appointed to the U.S. Senate had the states’ interests in mind. With the ratification of the 17th Amendment, the balance of the state and federal government was thrown off. U.S. Senators no longer had the states’ interests in mind, rather the constituents who elected them, allowing pork-filled bills through. And with the introduction of the Federal Reserve, the temptation for deficit spending grew too great as debt accumulated and continues to pile up. Choose Freedom, Stop A Con-Con!